Many gamers are loyal to their local game store and some gamers only care about price and will buy online. But there are times when circumstancess prevent you from using your preferred vendor: the holidays, vacations, etc. At those times you just want to buy a game to play with friends and family, and you need it now. In this Top 6 article, I’ll walk you through some of the surprising games you might reasonably expect to find in a Target store near you! Wondering how I compiled this list? I visited Target.com, drilled down to the following subset of merchandise, then selected games that I’ve played and find appealing! 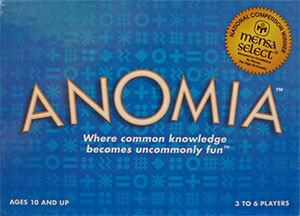 The first game on our list is a simple card based party game called Anomia. This one also made our list of the Best Board Game Gifts of 2016. In Anomia, players take turns flipping cards containing a mixture of different symbols and categories like “Mystery Novelists”, or “Aircraft”, or “Fairy Tale Character”. If a player flips a card which displays a symbol that matches that of another player at the table, each player must quickly name something matching the category found on the other player’s card. Whichever player answers correctly first gets the card of the other player. Play continues until the deck runs out and then the player with the most cards wins the game. Anomia is a no brainer for a store like Target. It’s small, clever, inexpensive, and filled with fun. Buy it at Target then throw the Anomia box into your bag and keep it with you for the next time you’re looking for something quick to play! Lift It! is a zany dexterity game that has players using their heads. Literally. In Lift It!, players are racing around a track drawing cards which requires them to build structures from Erector style 3d plastic blocks. The catch is that players have to use a crane and hook assembly to pick up the blocks. Sometimes you’re allowed to guide the hook with your hands, but other times you have to attach the crane to a headband and guide it using head and neck movements. Each correctly placed piece will gain players a point, while completing the entire card will earn them bonus points based on how many pieces are in the structure. The first player to reach the finish line wins the game. 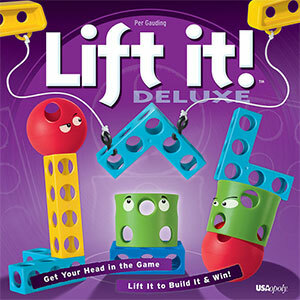 I’ve played Lift It! with my kids and it’s a really fun game. The pieces are all different colors and shapes and are really cool; plus they stack together really well. This one would easily be a blast with family during a vacation, or really any other time! Some people call The Game of 49 “bingo on steroids”, but that’s not giving it enough credit. 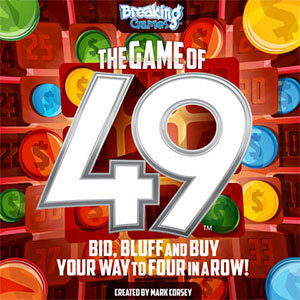 The Game of 49 turns Bingo on its ear by requiring players to bid for the spots which will win them the game. The Game of 49 is set upon a 7 by 7 board with 49 distinct numbers. Each turn the active player flips a card displaying one of the numbered spaces on the board, and offers that space up for auction. Players take turns bidding for the right to place one of their chips onto that space. Watch out though because money is tight! Players earn income to purchase more squares by turning over payout cards which will earn all players money based on how many squares they already have on the board. The game is a constant balance of buying squares to both help you win and earn you money, and also preventing your opponents from doing the same. I highly recommend picking up this game. It plays pretty fast (about 30 minutes), and because it’s essentially Bingo, new players will already know most of the rules. There’s not much more that I can say about Lost Cities that hasn’t already been said; by this very site in fact. It’s a tight card game of set collecting and going on wild expeditions, and it’s available at Target! 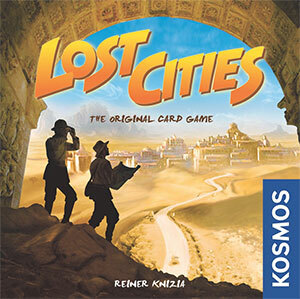 Lost Cities is a richly illustrated game with tight decisions, challenging choices, and high scoring. Each player has the option of sending their explorers out to one, or more, of 5 different environments. Play cards to that location in ascending order, but watch out because you immediately lose points and must play enough cards to that location to make up for the deficit. Do you draw cards from the draw pile, or pick up a card your opponent discarded? Do you start many new locations hoping to get the cards you need, or do you double down on one or two? Lost Cities is an excellent game, and here’s to hoping that its placement on Target shelves will expose its game play to the masses! Splendor is a simple game about trading up. In Splendor players act as gem merchants collecting raw ingredients in the form of red, blue, green, black, or white chips (gems), then trading those gems in for increasingly more valuable cards. These cards not only give players points, but also provide ongoing revenue which can be used to purchase even more expensive cards, and so on. The end goal of the game is to be the first player to reach 15 points. Splendor is an excellent intro, or “gateway” game. The rules are very simple to understand, turns are short, and the game itself generally takes between 30-45 minutes depending on player count. Splendor isn’t deep, but it’s full of great choices, and offers many approaches to earning points. The components are great quality, and the art is beautiful. 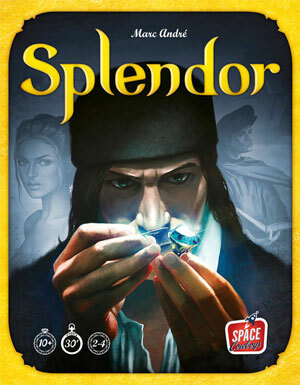 If you’re agonizing over one game to pick up at Target, Splendor is a great choice! New York: 1901 (or “Tetris for the real estate market”) is a game which casts players as Barons of real estate, buying and developing plots of land in turn of the century Manhattan. 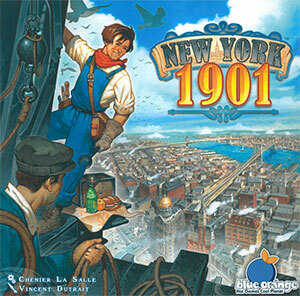 In New York: 1901 players will be in a race to develop Manhattan’s Financial District into the modern Metropolis we all know and love. Set the wayback machine to 1901 as players race to build “Bronze” level buildings, then slowly advance through Silver and Gold, finally culminating in one of four legendary skyscrapers — the Park Row, the Singer, the Metropolitan Life, or the majestic Woolworth. The game is bright and colorful, with amazing art from Vincent Dutrait; truly one of board gaming’s most amazing artistic talents. The game is compelling, and interesting, and since it takes place on real life streets, players really feel as if they’re contributing to the rise of one of America’s most iconic cities. It’s so wonderful to find a game of this caliber at Target. Kudos to their purchasing managers and congratulations to Blue Orange Games on tapping into this lucrative market. What do you think about Top 6 Games You Can Buy at Target? Give us your opinions in the comments below!